It's an odd title for a post, I know, but let me explain. 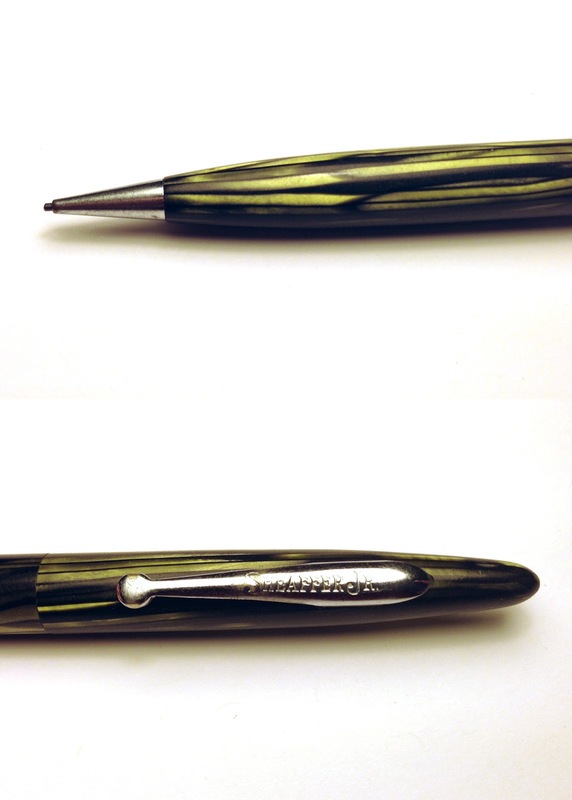 The Sheaffer Jr. mechanical pencil pictured in the photo above once resided in the desk of a man I love and respect very much- my grandfather, John. It feels weird to refer to "Grandpa" as my grandfather because it seems too formal. The photo on the left is exactly as I remember him (minus the fish, those were only around for special occasions). This may as well have been his retirement uniform, as he wore something similar every day. During his working years, he was a fireman and carpenter as well as a devoted family man. He retired before I was born and spent his time volunteering for the local fire department, gardening, and spending time outdoors hunting and fishing. No matter what he was doing he always had a mischievous grin on his face and love in his heart. To say that as a child I was highly energetic would be a gross understatement, but Grandpa John would always let me "help" him with some project he was doing around the house or garden. He was constantly working with his hands, whether it was saving lives as a fireman, working with wood as a carpenter, or growing food for his family in his large garden. One Summer, he taught me how to make my very own "flipper" (slingshot) from a scrub oak branch, some surgical tubing and scrap leather. I still have it and I hope to teach my kids how to do it some day. While I'm sure he helped other grandkids make their own "flippers", one thing that he and I alone shared was collecting coins. Grandpa started collecting coins in his downtime at the firehouse. They would exchange coins with other firemen all over the world (at least this is how I remember it) as something to do when not out on a call. He had books, and boxes, and containers of coins all stashed away in a big, gray, steel desk at his house. I would pour over his collection every time I went to visit and eventually started a collection of my own. He would bring me coins when they would come to visit and I would run off to put them in a protective sleeve in my room. He would just chuckle because he was just carrying them in his pocket with his keys and I treated them like a precious jewel. Years went by and I became a teenager and other thoughts filled my head besides coins and "flippers". I would still pull out his collection occasionally when I would go visit, but it happened much less often. As time continued, the inevitable happened, my grandparents both passed away. Our family still owns my grandparents' home and we spend time there regularly, both to get away for a short time and to feel close to them. One of the many trips to their home, I found myself sitting at my grandpa's desk. It's big and grey with a rubber top for writing. I looked down at the big file drawer on the right side where the coin collection had once resided (it now has been passed to the family). I pulled the handle and the once heavy drawer opened easily and showed me it's emptiness. It made me miss my grandpa terribly. I shut the big file drawer and started looking through the rest of the desk. I pulled open the long, thin center drawer. It was filled with common items one would expect to find in a desk. 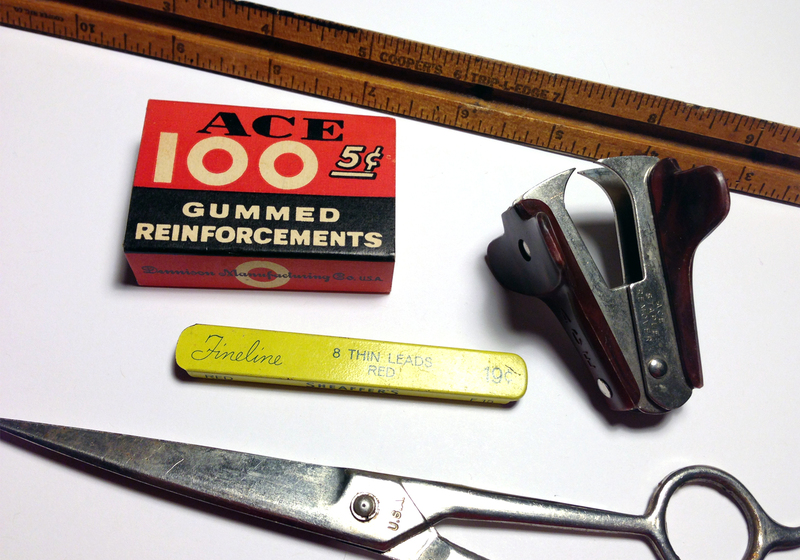 I found a wooden, triangular ruler, pencil leads in a metal container, scissors, and a staple remover, among many other items. I started setting these more interesting items aside as I went, thinking about my grandpa using them and I felt better. I eventually came across this pencil. I didn't notice it as anything special at first, but after reexamination, the variegated green material shown iridescent when the light hit it. It was a Shaeffer Jr. mechanical pencil. I have no idea where my grandpa got this pencil. It was among old, dried-up ballpoints given away by the local lumberyard, not in a special case or spot in a drawer. I would guess that he either found it or it was given to him by someone in passing. It didn't matter to me either way because it was his. This pencil sat next to him as he drew up plans for furniture, did taxes and paid bills. It waited silently as I spent many childhood hours pouring through boxes of coins just inches away. 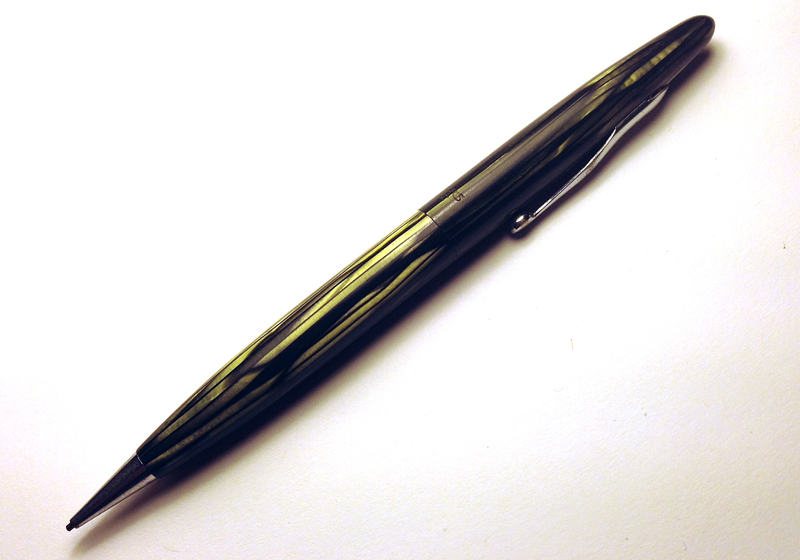 When I held this pencil, I felt like it connected me to Grandpa John, even if just a small, imagined way. I now keep this pencil in my desk drawer in my office. Anytime I open the drawer where I keep it, I notice it sitting there. 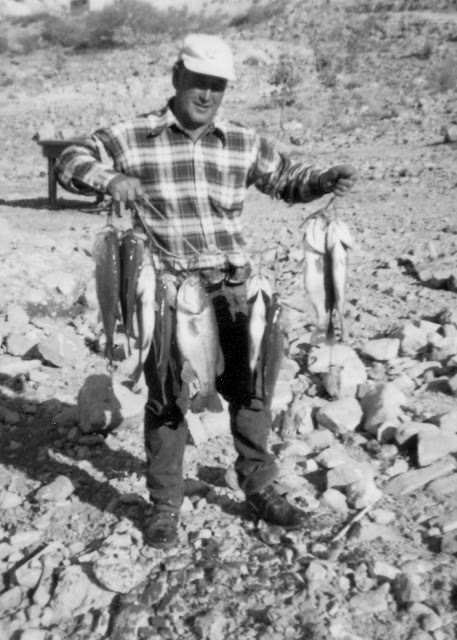 Very often, I will stop what I am doing and will hold it in my hands and think about Grandpa and all that he taught me. I love you Grandpa John. Happy Father's Day. A very sweet tribute that warmed my heart! Thanks for sharing this story Dan, and for sharing your grandfather with us.